Fixed: bootshieldsvc and offline files disabled after a reboot for Lenovo machines) – Absoblogginlutely! For the short answer go here. For those of you that follow me on Facebook, you may have seen my frustration with Microsoft support. I had to log a support call with their support as every time my computer rebooted, offline files were disabled. Unfortunately the technician attempting to support me obviously had no idea of what offline files were or even how to create a new user account in Windows7 (to troubleshoot if it was my account or not that was causing the problem). At no point in time did either of the 3 techs look at the event log, despite me trying to tell them there was issues reported in the log. To cut a very long and frustrating story short, I initially followed the diagnostic steps at Jonathan’s blog and the follow up post but the setting was still disabled after a reboot. I did find that enabling the offline files service from disabled (or manual) and then starting the service, the offline files were temporarily enabled. shows this is a known problem with Lenovo’s rapid boot software. The Rapidshield patch from Lenovo was downloaded, extracted, installed and the pc rebooted and sure enough offline files was STILL not enabled. Urgh. clicking start, and entering RapidBoot confirms the version is 1.23 and the gui has an option to disable the feature. This requires a reboot so I used the opportunity to re-enable offline files again and rebooted – STILL disabled. After another reboot, just to be sure Offline files was still disabled. Checking RapidShield Gui, the software claims it is not running, but checking the application log after a reboot still shows the various errors – for example Event 256 for BootShieldsvc – “An error has occured (—query FLAG_AUTO_SVC_CHANGED key success failed with 1,The Code is:0x24.). Apart from the fact that there is a “success failed” – it’s really not encouraging that software is still running and making changes despite it being disabled. Next stop was an uninstall (and enabling offline files again) followed by yet another reboot. It’s a good thing this machine is fast at rebooting. So after uninstalling – the problem still occurs – arghhhhhhhh. Next stop is to try and hack out the Fast Boot Service of Lenovo. UNfortunately I get access denied when trying to stop the service. msconfig stops the service but it still somehow manages to try and make changes as evidenced by the events in the eventlog after a reboot. 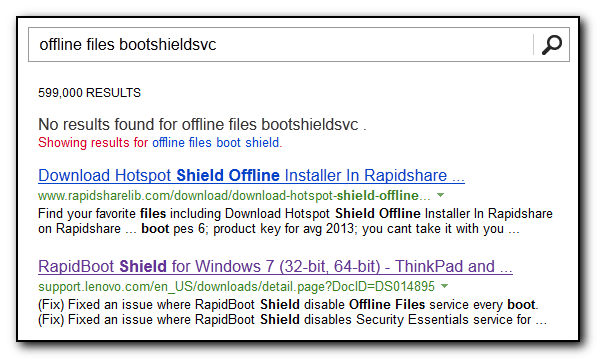 sc delete “BootShieldSvc” from an elevated command line also removes the service but it comes back after a reboot. After a reboot into safe mode I was able to disable the Fast Boot Service of Lenovo, set the Offline Files to be automatic and now offline files works. Uninstall the Lenovo Rapidshield software (or upgrade). If that fails – boot into safe mode, disable Fast Boot Service of Lenovo, Set Offline Files to automatic. The short answer was good but the long answer is what I needed to rid myself of this Lenovo headache. Thanks. We spent a lot of time tracking down this issue. For us, uninstalling RapidbootShield was sufficient. Dammit Lenovo! Thanks Andy.